Johannes Brechmann from Yacht Moments has been in touch to announce his appointment as Central Agent for the sale of a 31.7m Sanlorenzo 104 superyacht called 500. 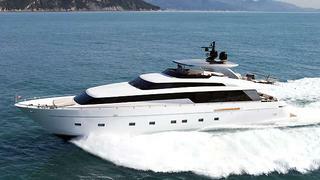 Built in 2010 at the Sanlorenzo yard in Italy, 500 sleeps seven guests in four cabins. Exterior design is by Francesco Paszkowski, and the interior is by Rodolfo Dordoni. When first launched, the 104 series won of the Design and Innovation Award by the Italian Design Association ADI for her interior design. She has a combination of light grey lacquered wood, teak, beige leather, bronzed panels, polished stainless steel ceilings. With twin MTU 16V 2000 M93 engines, 500 has a top speed of 29 knots and a cruising speed of 25 knots. Lying in Mallorca, Spain, 500 is asking €6,980.000, tax paid.